As we scramble up the muddy bank of western Burma’s Chindwin River, a group of farmers stops unloading bananas from ox carts on to an open wooden boat to watch our erratic progress, and a small welcoming committee gathers at the top. Word spreads quickly, and walking with our guide through the small settlement of Kae Daung soon resembles a scene from the Pied Piper, with more than 50 villagers following in our wake, more joining along the way. Our downstream journey from Homalin, close to the Indian border and 600 miles from the Chindwin’s confluence with the better-known Irrawaddy, has been hastened by the current. So the captain decides to make one of several unscheduled stops during our week-long journey to Monywa. It is only the second time he has stopped at this village, and in a refreshing reverse of the usual tourism model. We are the subject of much inquisitiveness. Men wearing the traditional skirt-style longyi grin as we pass, revealing teeth stained vivid red from chewing betel nuts. Women, faces adorned with the yellowish-white cosmetic thanaka, wave from stilted wooden houses, while children giggle and run away squealing as one of the members of our party pretends to chase them. Burma was closed off from the rest of the world for much of the duration of the military dictatorship that ruled from 1962 to 2011, and today remote areas are populated by people who have had little or no contact with foreigners; indeed, we don’t meet any other tourists during our time on the Chindwin. 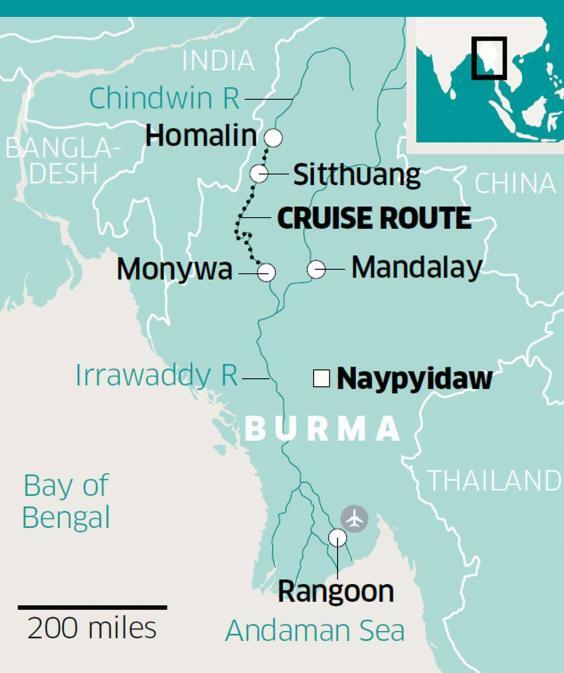 Burma historian Paul Strachan pioneered river cruises in this captivating country and, with their low draft, Pandaw’s vessels can navigate the northernmost stretches of the Chindwin that are inaccessible to the few other expedition ships plying the waters. In 2015, the 20th anniversary of his cruise line, coincided with the 150th anniversary of the colonial Irrawaddy Flotilla Company that inspired Pandaw’s ships. Sadly, the only reminder we see of the once mighty fleet is a rusty boiler abandoned beside the river in Sitthaung, the final resting place of a number of IFC steamers scuppered there in 1942. 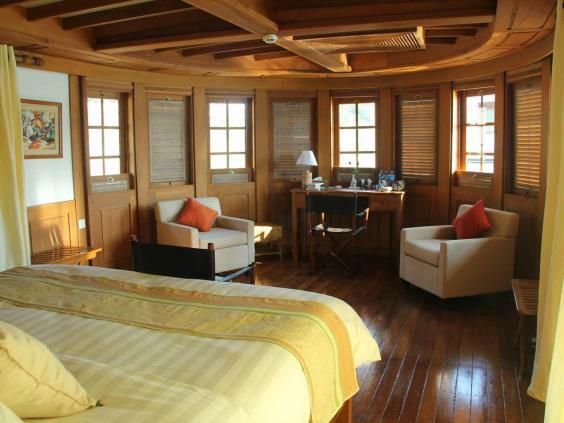 Our vessel, the two-deck Kalay Pandaw, is handsomely decked out in teak and brass. It carries only 10 passengers and nine crew, so we soon get to know each other. The upper deck, a combined sun deck and al fresco dining area, has an enclosed bar that can be used for meals in the unlikely event of bad weather. The Homalin to Monywa cruise season runs from the summer to late autumn, with condensed itineraries through to February due to low water levels. Nevertheless, any journey is governed by Mother Nature. Going with the flow, quite literally, and being flexible encapsulates the whole essence of river cruising in Burma. One morning a dense, ethereal mist hangs low over the water and obscures the banks and surrounding hillsides, so we cannot cast off until it lifts. The following day we are stranded mid-river on one of the submerged sandbars that shift during the monsoon season. We guiltily eat lunch while two crew members spend a couple of hours in the waist-high water, helping to manoeuvre the vessel back into a deeper channel. We sail only during the day, against a skyline of bell-shaped Buddhist stupas or pagodas that form the backbone of every village, watching timeless vistas of fishermen casting nets from tiny boats, women panning for gold in the shallows, and ox teams ploughing the fertile soil on the banks. With no railway or significant road infrastructure, the river is a working artery. Our path is criss-crossed by vessels laden with oil drums and ferries transporting people and supplies between villages, heralding their arrival and departure with an amplified blast of music. Occasionally, vast rafts of teak timber lashed together by bamboo float past. At night we are rewarded by clear, inky skies unimpeded by light pollution. From the kaleidoscope of stars our guide points out the Southern Cross, Capricornus, Scorpius and other constellations. Highlights include excursions to the Phowintaung hill caves, populated by monkeys and filled with ancient images of Buddha and wall murals; and the spectacular and colourful Thanbodi Temple outside Monywa, with its estimated one million Buddhas. 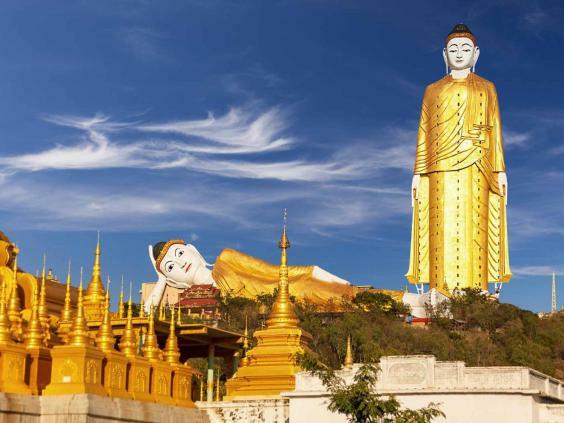 Towering over the nearby countryside is the imposing 412ft giant standing Buddha, the largest in Burma, and the serene 330ft reclining counterpart, where tiny silhouettes of birds can be seen resting on its sweeping eyelashes. Another day we set off on the onboard bikes, negotiating furrowed tracks that are a legacy of the monsoon. Back on board we are suitably refreshed with cold towels and the complimentary cocktail of the day. Dinner showcases delicately spiced Burmese dishes and ingredients bought by the two chefs at local markets. By the end of the week, I bypass the Western breakfast offerings for soup or stir-fried noodles flavoured with coriander, sesame seeds, chilli, garlic, bean paste and lemon. After the 83-mile transfer to Mandalay, the country’s second city and former capital, I watch the final sunset, this time mirrored in the Irrawaddy.